Cheap non-stop flights from London to Atlanta from £236 return! Based on British Airways, the flag carrier and the largest airlines in the United Kingdom (fleet size), you can book greatly discounted non-stop flights from London Heathrow to Atlanta Hartsfield-Jackson, the largest and busiest airport in the world. This offer is for a roundtrip incl. all taxes and fees. There is no checked luggage thought and you would have to purchase separately for extra cost..
British Airways promotional offer from London to Atlanta is available when traveling in second half of September or first half of October 2018. Also 1st of April to 15th of July 2019. Max stay 12 months. British Airways discount is available till 25th of September or until the cheapest seats last. 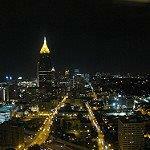 Want to book your accommodation in Atlanta in advance we recommend Booking.com or Hotels.com. The cheapest option is directly with the airline where you can easily compare all the cheapest deals. Booking sample of British Airways promotional deals below. Cheap non-stop flights from London to Atlanta from £236 return! As per our booking sample you would depart from London Heathrow to Atlanta on 9th of October. Your inbound flight from United States of America back to the United Kingdom would be then on 23rd of October 2018.